It’s the weekend before Easter and Earth Day. That means you can find events and things to do across the Treasure Coast celebrating these holidays before they happen. The 15th annual Earth Day Festival is 10 a.m. to 3 p.m. Saturday at Oxbow Eco-Center at 5400 N.E. St. James Drive in Port St. Lucie. 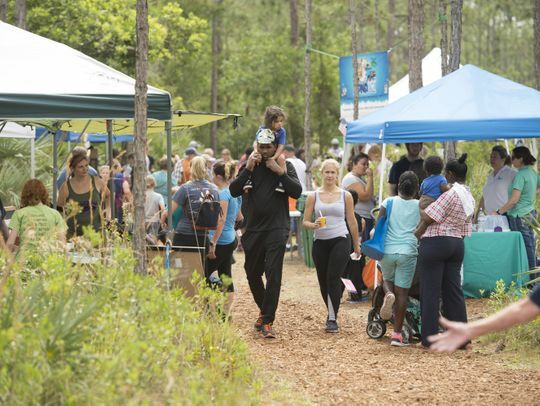 The festival features exhibitions that include the Treasure Coast Wildlife Center, animal handler Reptile Riff, the Friends of Savannas Preserve State Park, the Florida Fish and Wildlife Conservation Commission, Florida’s aquatic preserves, the Treasure Coast Beekeepers Association, Tinkergarten children’s activities, the University of Florida’s Institute of Food and Agricultural Sciences Extension, the St. Lucie Cultural Alliance, St. Lucie County’s Environmental Resources Department, Florida Atlantic University’s Harbor Branch Oceanographic Institute, the Smithsonian Marine Station at Fort Pierce and the Florida Oceanographic Society. Plus, there is live entertainment, as well as food and beer for sale. Admission is free. Carpool, kayak or bicycle to the event to reduce your ecological footprint. Trolley service to and from the event is available from 8 a.m. to 4 p.m. at Calvary PSL at 5555 N.W. St. James Drive. The event is rain or shine. No dogs allowed. For more information, call 772-785-5833 or go to www.stlucieco.gov. The Spring Community Mixer and Egg Hunt is 10 a.m. to noon Saturday at the 10th Street Community Center at Guy Davis Sports Complex at 724 S.E. 10th St., in Stuart. Hunt areas are divided into four groups: ages 4 and younger, ages 5-7, ages 8-10 and ages 11-12. The event also includes golden eggs, face painting, carnival games, inflatable games, popcorn, snow cones and a free hot dog lunch. Admission is free. For more information, call 772-288-5340. The City of Vero Beach Recreation Department’s 59th annual Easter Egg Hunt is 10-11 a.m. Saturday at Mulligan’s Beach House at 1025 Beachland Blvd. The event includes a beachside egg hunt, golden egg winners, a jellybean guessing contest and a visit from the Easter Bunny. The hunt for kids ages 9 and younger is free. Bring six empty plastic eggs for donation. For more information, call 772-770-6517 or go to www.covb.org. The Easter Eggstravaganza is 10:45 a.m. to 2 p.m. Sunday at the First United Methodist Church at 1500 S. Kanner Highway in Stuart. The event includes an Easter egg hunt starting at 12:30 p.m., a bounce house, games and crafts, as well as barbecue and snow cones for sale. Admission is free. For more information, go to www.facebook.com/fumcstuartkids. Hopping for a Cure is noon to 4 p.m. Sunday at Walking Tree Brewery at 3209 Dodger Road in Vero Beach. The event includes a petting zoo, crafts, games, pony rides and a visit from the Easter Bunny, as well as beer discounts for parents. Admission is a $5 donation to benefit the St. Baldrick’s Foundation of Indian River County. For more information, call 772-217-3502 or go to www.facebook.com/walkingtreebrewery. The 16th annual Hibiscus Festival is 10 a.m. to 6 p.m. Saturday and 10 a.m. to 4 p.m. Sunday along 14th Avenue in downtown Vero Beach. The Miss Hibiscus Pageant is 7-9 p.m. Thursday at the Heritage Center at 2140 14th Ave. The festival, which is celebrating the city’s centennial this year, features more than 50 artists displaying art, a children’s art show, live music, entertainment, food for sale and children’s activities. Plus, the 10th annual Shopping Cart Parade food drive starts at 1 p.m. Friday and benefits United Against Poverty. Also, the fifth annual Hibiscus Ride starts at 9 a.m. Saturday and travels from American Icon Brewery to Ocean Grill to Waldo’s to McKee Botanical Garden. It features speakers and local historians sharing interesting facts and information at each destination. The cost for the ride is $25 and includes a shirt. To register, go to hibiscusbikeride.eventbrite.com. For more information, call 772-299-1383 or go to mainstreetverobeach.org/hibiscus-festival. Citizen Science Day is noon to 4 p.m. Saturday at the Environmental Learning Center at 255 Live Oak Drive, north of Vero Beach. The day includes quick canoe trips, seining activities, making birdhouses and rain barrels, rescued wild birds, booths showcasing projects, demonstrations, and science talks and workshops. Researchers explain why they need citizens to help with critical projects, such as spotting otters, tracking bats and birds or identifying invasive plants and reptiles. Admission is free. Canoe trips and seining require close-toed water shoes. Seining is from 1-3 p.m. For more information, go to www.discoverelc.org/citizen-science-day. Sailfish Brewing Company’s sixth anniversary block party starts at 2 p.m. Saturday and lasts until midnight at 130 N. Second St., in downtown Fort Pierce. Kegs are tapped when doors open at 11 a.m.
Four live bands play at different times throughout the day on a stage set up on Second Street, which is shut down between Marina Way and Orange Avenue. Plus, there are beer releases, outdoor bars, street games, artists, vendors, children’s activities and food for sale from The Crafted Pie and 2nd Street Bistro. Plant City Poptart kettle sour treated with strawberries from Plant City, vanilla and lactose. An unnamed blueberry kettle sour treated with blueberries from Double C Bar Ranch in Kenansville and cinnamon. Blackberry Bramble kettle sour treated with blackberries from Bramble Creek Farms in Brooksville, limes from the Florida Research Center for Agricultural Sustainability in Vero Beach and mint. Passing Lane kettle sour treated with pineapples from Nature Farms in Sebastian, limes from the Florida Research Center for Agricultural Sustainability in Vero Beach and honey from Hani Honey Company in Stuart. Zest-A-Peel kettle sour treated with honeybells and Rangpur limes from the Florida Research Center for Agricultural Sustainability in Vero Beach. PBS kettle sour treated with blackberries from Bramble Creek Farms in Brooksville, blueberries from Double C Bar Ranch in Kenansville and peaches from Vero Beach. Admission is free. For more information, go to www.facebook.com/sailfishbrewingcompany. The Winery Comedy Tour is 7-9 p.m. Friday at Summer Crush Vineyard & Winery at 4200 Johnston Road, north of Fort Pierce. Gates open at 5:30 p.m. Food is for sale from 6-7 p.m. Tickets are $15 each. Then, the Horsin’ Around in the Vineyard: Mustang and All-Ford Car, Truck & Art Show is noon to 4 p.m. Sunday. Admission is free to spectators. Food trucks are available. For more information, call 772-460-0500 or go to www.summercrushwine.com. St. Andrew’s Episcopal Academy Community Family Day is 12:30-4 p.m. Sunday at 210 S. Indian River Drive in Fort Pierce. The riverfront campus is filled with children’s sports, an obstacle course challenge, arts and crafts, food and drinks, raffles, prizes and a silent auction. Admission is peanut butter and jelly to benefit Mustard Seed Ministries. For more information, go to www.facebook.com/standrewsepiscopalacademy. The Niña and Pinta replicas of Christopher Columbus’ ships are open for self-guided tours from 9 a.m. to 6 p.m. every day this weekend at the Vero Beach City Marina at 3611 Rio Vista Blvd. The ships arrived Monday and opened Tuesday, and they will be docked in Vero Beach until their departure April 18. Admission is $8.50 for adults, $7.50 for seniors, $6.50 for kids ages 5-16 and free for kids ages 4 and younger. For more information, go to www.ninapinta.org. The Vero Beach Arts & Crafts Expo Spring Edition is 10 a.m. to 5 p.m. Saturday and 10 a.m. to 4 p.m. Sunday at the Indian River County Fair Grounds at 7955 58th Ave., north of Vero Beach. Admission is free. For more information, go to www.artandcraftexpo.com. The 22nd annual Downtown Stuart Craft Festival is 10 a.m. to 5 p.m. Saturday and Sunday at 26 S.W. Osceola St., in Stuart. Admission is free. For more information, go to www.artfestival.com. The Jensen Beach Art League’s art show is 10 a.m. to 4 p.m. Sunday at Indian RiverSide Park at 1707 N.E. Indian River Drive. For more information, call 772-486-5240 or go to jensenbeachartleague.yolasite.com. A DJ and teen-only access to the waterpark is 6-8 p.m. The movie, “Avengers: Infinity War” plays on the big screen from 8-10 p.m. while teens watch from inner tubes in the pool. Admission is free. For more information, call 772-334-1954 or go to www.martin.fl.us/teens. The fourth annual PSL Taste of the Islands Caribbean food and live music festival is noon to 10 p.m. Sunday at Causeway Cove Marina at 601 Seaway Drive in Fort Pierce. The festival also features craft vendors, a talent showcase and a children’s zone. Admission is $10 for adults and free for kids younger than 12. For more information, go to www.facebook.com/psltasteoftheislands. Laurie K. Blandford is TCPalm’s entertainment reporter and columnist dedicated to finding the best things to do on the Treasure Coast. Read her weekly column, Laurie’s Stories, on TCPalm.com. Follow her on Twitter at @TCPalmLaurie or Facebook at faceboook.com/TCPalmLaurie.